ow I saw in my dream, that the highway up which CHRISTIAN was to go was fenced on either side with a wall; and that wall was called "Salvation". So burdened CHRISTIAN ran up this way; but not without great difficulty, because of the load on his back. He ran thus till he came at a place somewhat upwards; and upon that place stood a Cross, and a little below, in the bottom, a tomb. 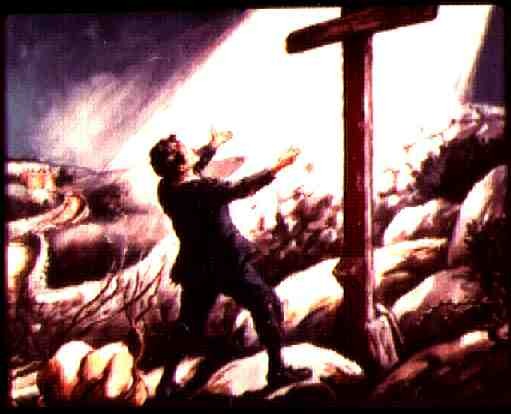 So I saw in my dream, that just as CHRISTIAN came up to the cross, his burden fell from his shoulders, and from off his back, and began to tumble; and so continued to do till it came to the mouth of the tomb, where it fell in, and that was the last I saw of it. Then he stood still awhile to look and wonder; for it was very surprising to him, that the sight of the cross should ease him of his burden in this way. He looked therefore, and looked again, even till the springs that were in his head sent tears down his cheeks. saw then in my dream that he went on this way until he came to the bottom, where he saw, a little out of the way, three men fast asleep, with shackles upon their heels. The name of the one was SIMPLE, another SLOTH, and the third PRESUMPTION. CHRISTIAN then seeing them lying in this condition, went to them, if he might perhaps awake them, crying, "You are like them that sleep on the top of a mast, for the Dead Sea is under you, a gulf that has no bottom. Wake up now, and come away; be willing also, and I will help you off with your irons." He also told them, "If he that goes about like a roaring lion comes by, you will certainly become a prey to his teeth". Sloth said, "Let me sleep a little more." And so they laid down to sleep again; and CHRISTIAN went on his way. et he was troubled to think, that men in that danger should so little esteem the kindness of him that so freely offered to help them: both by awakening them, counselling them, and offering to help them off with their irons. And while he was thinking about it, he saw two men come tumbling over the wall, on the left hand of the narrow way, and they quickly came to him. The name of one was FORMALIST, and the name of the other HYPOCRISY. So, as I said, they drew up to him, and he entered into conversation with them. Chr. Gentlemen, where have you come from, and where are you going? Chr. Why did you not come in at the gate which stands at the beginning of the way? Do you not know that it is written, that "he that does not enter in by the door, but climbs up some other way, the same is a thief and a robber?" Form. and Hyp. They said, that to go to the gate for entrance was counted by all their countrymen too far; so their usual way was to make a short cut of it, and to climb over the wall as they had done. Chr. But will it not be counted a trespass against the Lord of the city where we are bound, to violate his revealed will in this manner? Form. and Hyp. They told him that, as for that, he needed not to trouble his head about it; for what they did they had custom for, and could produce, if need be, testimony that would witness for it, for more than a thousand years. Form. and Hyp. They told him, that a custom that had stood for more than a thousand years, would doubtless now be admitted as a thing legal by any impartial judge. And besides, they said, if we get into the way, what does it matter which way we get in? If we are in, we are in: you are only in the way, who, as we perceive, came in at the gate; and we are also in the way, that came tumbling over the wall. In what way is your condition better than ours? Chr. I walk by the rule of my Master; you walk by the rude working of your fancies. You are counted thieves already by the Lord of the way, therefore I doubt you will not be found true men at the end of the way. You come in by yourselves without his direction, and shall go out by yourselves without his mercy. To this they said little, only they told him watch out for himself. Then I saw that they went on every man in his way, without much conversation one with another, save that these two men told CHRISTIAN, that as to laws and ordinances, they thought they would do them as conscientiously as he. "Therefore," they said, "we see no difference between you and us, except the coat that is on your back; which was, as we think, given you by some of your neighbours to hide the shame of your nakedness." Chr. By laws and ordinances you will not be saved, since you did not come in by the door. And as for this coat that is on my back, it was given me by the Lord of the place where I go; and that, as you say, to cover my nakedness with. And I take it as a token of his kindness to me, for I had nothing but rags before. And besides, I comfort myself as I go in this way thinking, Surely, when I come to the gate of the city, the Lord of it will know me for good, since I have his coat on my back, a coat that he gave me freely in the day that he stripped me of my rags. I have, furthermore, a mark in my forehead, of which, perhaps, you have taken no notice, which one of my Lord's most intimate associates fixed there in the day that my burden fell off my shoulders. I will tell you, also, that I had been given then a sealed roll, to comfort me by reading as I go in the way; I was also commanded to give it in at the Celestial Gate, in token of my certain entrance after giving it: I doubt that you have any of these things, and you do not have them because you did not come in at the gate. To these things they gave him no answer, they only looked at each other and laughed. Then I saw that they all went on, except that CHRISTIAN kept ahead, and had no more talk but with himself, and that sometimes sighingly, and sometimes comfortably; also he would often be reading in the roll that one of the shining ones gave him, by which he was refreshed. Come, pluck up, heart, let's neither faint nor fear! The other two also came to the foot of the hill. But when they saw that the hill was steep and high, and that there were two other ways to go; and supposing also that these two ways might meet again with that up which CHRISTIAN went, on the other side of the hill, resolved to go in those ways (now the name of one of those ways was "Danger," and the name of the other "Destruction"). So the one took the way which is called Danger, which led him into a great wood; and the other went directly up the way to Destruction, which led him into a wide field full of dark mountains, where he stumbled and fell, and rose no more. 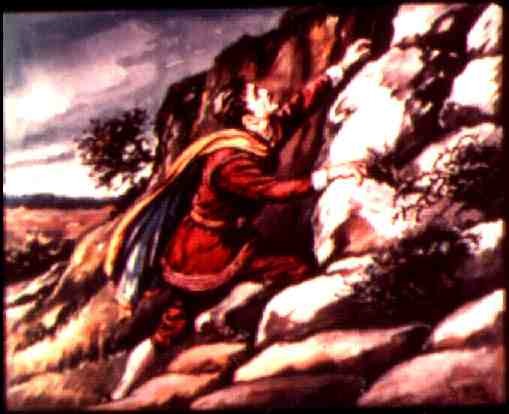 looked then after CHRISTIAN, to see him go up the hill, when I perceived he stopped running and began walking, and from walking to clambering upon his hands and his knees, because of the steepness of the place. Now about midway to the top of the hill was a pleasant arbour, made by the Lord of the hill, for the refreshment of weary travellers. There CHRISTIAN went in and sat down to rest. Then he pulled his roll out of his bosom, and read it for his comfort; he also now began afresh to take a review of the coat or garment that was given him as he stood by the cross. Thus pleasing himself awhile, he at last fell asleep, and then into a deep sleep which detained him in that place until it was almost night, and in his sleep his roll fell out of his hand. Now as he was sleeping, one came to him, and awaked him, saying, "Go to the ant, you sluggard: consider her ways, and be wise". And with that, CHRISTIAN suddenly woke up, and went quickly on his way, untill he came to the top of the hill. Now when he got to the top of the hill, two men came running to him with great speed. The name of one was TIMOROUS, and the name of the other MISTRUST; to whom CHRISTIAN said, "Sirs, what's the matter? You run the wrong way!" Timorous answered that they were going to the City of Zion, and had got up that difficult place; "but," said he, "the further we go, the more danger we meet with: therefore we turned, and are going back again." Mistrust. "Yes," said MISTRUST; "for just before us lie a couple of lions in the way--whether sleeping or waking we know not,--and we thought, if we came within reach, they would instantly pull us in pieces." Chr. Then CHRISTIAN, said "You make me afraid; but where shall I run to be safe? If I go back to my own country, that is prepared for fire and brimstone--and I shall certainly perish there! If I can get to the celestial city, I am sure to be in safety there. I must continue: to go back is nothing but death; to go forward is fear of death, and life everlasting beyond it! I will continue forward! o MISTRUST and TIMOROUS ran down the hill; and CHRISTIAN went on his way. But thinking again of what he heard from the men, he felt in his bosom for his roll, so that he might read it, and be comforted; but he felt, and did not find it. Then CHRISTIAN was in great distress, and did not know what to do; for he lacked that which usually relieved him, and that would have been his pass into the Celestial City. So he began to be much perplexed here, not knowing what to do. At last he remembered that he had slept in the arbour that is on the side of the hill: and falling down on his knees, he asked God forgiveness for his foolish act, and then went back to look for his roll. But all the way as he went back, who can sufficiently describe the sorrow of CHRISTIAN'S heart ? Sometimes he sighed; sometimes he wept; and often times he scolded himself for being so foolish as to fall asleep in that place, which was erected only for a little refreshment from his weariness. that I should so indulge the flesh, as to use that rest in order to ease my flesh, which the Lord of the hill has erected only for the relief of the spirits of pilgrims! How many steps have I taken in vain! (thus it happened to Israel; for their sin they were sent back again by the way of the Red Sea); and I am made to tread those steps with sorrow, which I might have trod with delight, had it not been for this sinful sleep. How far might I have been on my way by this time! I am made to tread those steps three times over which I needed to tread only once: yes, now also I am like to be caught by darkness, for the day is almost spent. Oh that I had not slept!" Now by this time he had come to the arbour again, where for a while he sat down and wept; but at last (as CHRISTIAN would have it) looking sorrowfully down under the seat, he caught sight of his roll, which, with trembling and haste, he picked up, and put into his bosom. Who can tell how joyful this man was when he had hold of his roll again! For this roll was the assurance of his life and acceptance at the desired haven. Therefore he laid it up in his bosom; gave thanks to God for directing his eye to the place where it lay; and with joy and tears continued again on his journey. But oh, how nimbly now did he go up the rest of the hill! Yet before he got up, the sun went down upon CHRISTIAN; and this made him again recall the vanity of his sleeping, and thus he again began to lament with himself: "Oh, you sinful sleep! how for your sake am I likely to be caught by darkness on my journey! I must walk without the sun; darkness must cover the path of my feet; and I must hear the noise of the doleful creatures-- because of my sinful sleep!" Then he remembered the story that MISTRUST and TIMOROUS told him--how they were frightened by the sight of the lions. Then CHRISTIAN said to himself again, "These beasts range in the night for their prey; and if they should meet with me in the dark, how would I get past them? How would I escape being torn in pieces by them?" Thus he went on his way; but while he was bewailing his unhappy mismanagement, he lifted his eyes, and behold, there was a very stately palace before him, the name of which was "Beautiful," and it stood just by the side of the highway. o I saw in my dream that he hurried and went forward, that if possible he might get lodging there. 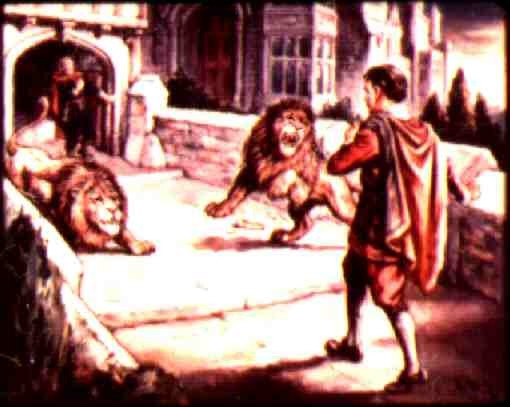 Now before he had gone far, he entered into a very narrow passage, which was about a furlong away from the porter's lodge; and, looking very narrowly before him as he went, he caught sight of two lions in the way. Now, he realised the dangers by which MISTRUST and TIMOROUS were driven back. (The lions were chained; but he did not see the chains.) Then he was afraid, and also thought to go back after them; for he thought nothing but death was before him. 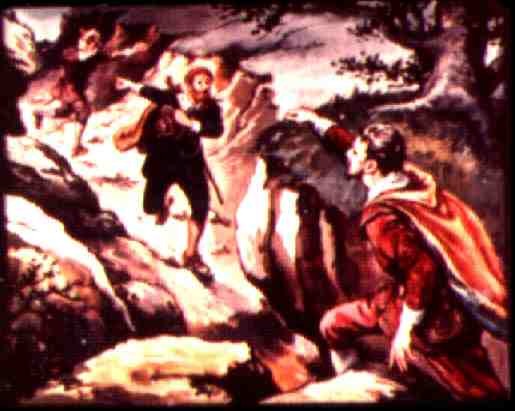 But the porter at the lodge, whose name is WATCHFUL, perceiving that CHRISTIAN halted, as if he would go back, cried out to him, saying, "Is your strength so small? do not fear the lions; for they are chained, and are placed there for the trial of faith; and to discover those that have none: keep in the middle of the path, and no harm shall come to you!" Then I saw that he went on, trembling for fear of the lions, but heeding well the directions of the porter. He heard them roar; but they did him no harm. Then he clapped his hands, and went on till he came and stood before the gate where the porter was. Then CHRISTIAN asked the porter, "Sir, what is this house? and may I lodge here tonight?" The porter answered, "This house was built by the Lord of the hill; and he built it for the relief and security of pilgrims." The porter also asked where he came from, and where he was going? Chr. I have come from the city of Destruction, and am going to Mount Zion; but because the sun is now set, I desire, if I may, to lodge here tonight. Watchful, the Porter. What is your name? Chr. My name is now CHRISTIAN; but my name at the first was GRACELESS: I came of the race of Japheth, whom God will persuade to dwell in the tents of Shem. Watch. But what happened that you are here so late? the sun is set! Chr. I would have been here sooner; but--wretched man that I am--I slept by the arbour that stands on the hillside. No, I would have been here much sooner if not for that, but that in my sleep I lost my evidence, and came without it to the brow of the hill; and then, feeling for it, and not finding it, I was forced, with sorrow of heart, to go back to the place where I slept. There I found it, and now I have arrived here. Watch. Well, I will call out one of the virgins of this place, who will, if she likes your intentions, bring you in to the rest of the family, according to the rules of the house. So WATCHFUL the porter rang a bell; at the sound of which, came out at the door of the house a dignified and beautiful girl, named DISCRETION, and asked why she was called. Watchful answered, "This man is on a journey from the city of Destruction to Mount Zion; but being weary and caught by the darkness, he asked me if he might lodge here tonight: so I told him I would call for you, who, after conversing with him, may do what seems good to you, even according to the law of the house." Piety. ome, good CHRISTIAN, since we have been so loving to you, as to receive you into our house this night, let us, if perhaps we may better ourselves by it, talk with you of all the things that have happened to you in your pilgrimage. Piety. 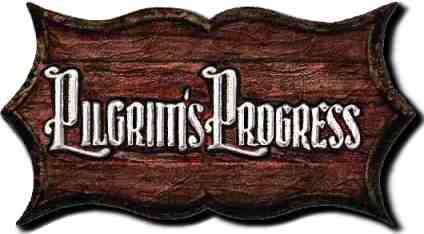 What moved you at first to take up a pilgrim's life for yourself? Chr. I was driven out of my native country by a dreadful sound that was in my ears, understanding that unavoidable destruction attended me if I remained in the place where I was. Chr. It was as God would have it; for when I was under the fears of destruction, I did not know where to go; but quite unexpectedly, a man came , even to me (as I was trembling and weeping), whose name is EVANGELIST, and he directed me to the Wicket gate, which I would never have found otherwise; and so he set me into the way that has led me directly to this house. Chr. Yes, and I saw such things there, which I will remember as long as I live; especially three things: namely, How Christ, in spite of Satan, maintains his work of grace in the heart; how the man had sinned himself altogether out of the hope of God's mercy; and also the dream of him that thought in his sleep the Day of Judgment had come. Chr. Yes, and a dreadful one it was, I thought; it made my heart ache as he was telling it; yet I am glad I heard it. Piety. Was that all that you saw at the house of the INTERPRETER? Chr. No: he took me and brought me where he showed me a stately palace; and I saw how the people that were in it were clad in gold; and how there came an adventurous man, and cut his way through the armed men that stood in the door to keep him out; and how he was bidden to come in and win eternal glory. Those things were ravishing to my heart: I could have stayed at the good man's house for twelve months but that I knew I had further to go. Piety. And what else did you see in the way? Chr. See! 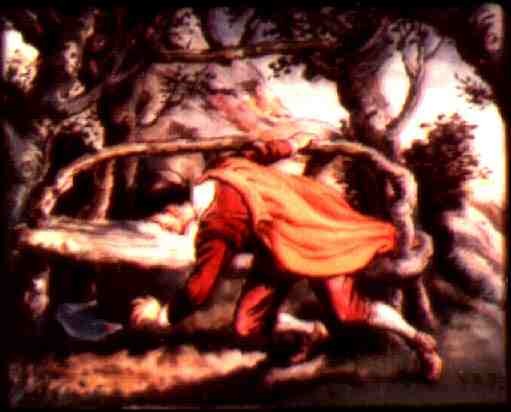 Why I went but a little further, and I saw One, as I thought in my mind, hang bleeding upon the tree, and the very sight of him made the burden fall off my back (for I groaned under a weary burden), but then it fell off me. It was a strange thing to me; for I never saw such a thing before. Yes, and while I stood looking up (for then I could not stop looking), three shining ones came to me: one of them testified that my sins were forgiven; another strippfred is a nerded me of my rags, and gave me this embroidered coat which you see; and the third set the mark which you see on my forehead, and gave me this sealed roll (and with that he plucked it out of his bosom). Piety. But you saw more than this, didn't you? Chr. The things that I have told you were the best; yet I saw some other small matters, as namely, I saw three men, SIMPLE, SLOTH, and PRESUMPTION, lie asleep a little out of the way as I came, with irons upon their heels; but do you think I could awake them! I saw also FORMALIST and HYPOCRISY come tumbling over the wall, to go, as they pretended, to Zion, but they were quickly lost; even as I myself told them, but they would not believe: but above all, I found it hard work to get up this hill, and as hard to come past the lions' mouths; and truly, if it had not been for the good man, the porter, that stands at the gate, I do not know but after all that, I might have gone back again. But now I thank God I am here, and I thank you for receiving me. hen PRUDENCE thought it good to ask him a few questions, and desired his answer to them. Prudence. Do you not think sometimes of the country you came from? Chr. Yes, but with much shame and detestation; truly, if I had been mindful of that country from where I came out, I might have had opportunity to have returned; but now I desire a better country, that is, a heavenly one. Pru. Do you not still carry with you some of the things that you were familiar with there? Chr. Yes, but greatly against my will; especially my inward and carnal thinking, with which all my countrymen as well as myself, were delighted. But now all those things are my grief: and if I could but choose my own things, I would choose never to think of those things anymore; but when I desire to do that which is best, that which is worst is with me. Pru. Do you not find sometimes, as if those things were overcome, while at other times they annoy you? Pru. Can you remember by what means you find your annoyances at times, as if they were overcome? Chr. Yes, when I think of what I saw at the cross, that will do it; and when I look upon my embroidered coat, that will do it; also when I look into the roll that I carry in my bosom, that will do it; and when my thoughts increase about where I am going, that will do it. and there I shall live with such company as I like best. For to tell you truth, I love him because I was eased of my burden by him, and I am weary of my inward sickness; I would gladly be where I shall die no more, and with the company that shall continually cry, "Holy, holy, holy." Charity. "Have you a family? Are you a married man?" Cha. And why did you not bring them along with you? Chr. Then CHRISTIAN wept, and said, "Oh, how willingly would I have done it! but all of them were utterly against my going on pilgrimage." Cha. But you should have talked to them, and have endeavoured to show them the danger of staying behind. Chr. So I did, and also what God had shown me of the destruction of our city; but I seemed to them to be joking, and they did not believe me. Cha. And did you pray to God that he would bless your counsel to them? Chr. Yes, and that with much affection; for you must rrealise that my wife and poor children were very dear to me. Cha. But did you tell them of your own sorrow, and fear of destruction? for, I suppose, that destruction was visible enough to you. Chr. Yes--over, and over, and over again. They could also see my fear in my face, in my tears, and also in my trembling under the apprehension of the judgment that hung over our heads; but it was not sufficient to persuade them to come with me. Cha. But what excuse did they have, why they did not come? Chr. Why, my wife was afraid of losing this world; and my children were given to the foolish delights of youth: so what by one thing, and what by another, they left me to wander in this manner alone. Cha. But did you not with your vain life dampen all that you, by words, used by way of persuasion to bring them away with you? Chr. Indeed I cannot commend my life, for I am conscious of many failings in my life; I know also that a man by his behaviour may soon overthrow what by argument or persuasion he labours to fasten upon others for their good. Yet this I can say, I was very wary of giving them occasion, by any unseemly action, to make them averse to going on pilgrimage. Yes, for this very thing, they would tell me I was too precise; and that I denied myself of sins (for their sakes), in which they saw no evil. No, I think I may say that if what they saw in me hindered them, it was my great sensitivity in sinning against God, or of doing any wrong to my neighbour. and if your wife and children have been offended with you for this, then they show themselves to be implacable to good; and you have delivered your soul from their blood. but not without great danger to himself, which made me love him even more. For, as they said, and as I believe (said CHRISTIAN), he did it with the loss of much blood; but the thing which put the glory of grace into all he did, was, that he did it out of pure love for his country. And besides, there were some of them of the household that said they had seen and spoke with him since he died on the cross; and they have attested that they had it from his own lips, that he is such a lover of poor pilgrims, that the like is not to be found from the east to the west. Furthermore they gave an instance of what they affirmed, and that was, he had stripped himself of his glory that he might do this for the poor; and that they heard him say and affirm that he would not dwell in the Mountain of Zion alone. 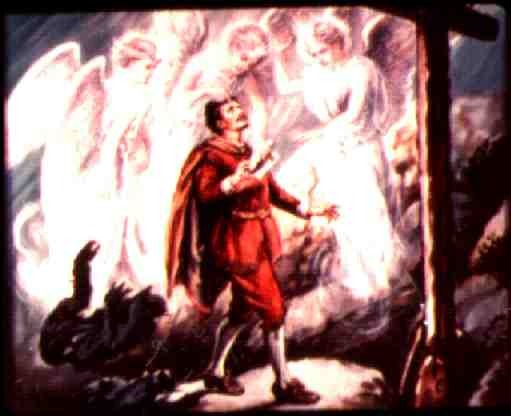 They said, moreover, that he had made many pilgrims princes, though by nature they were born beggars, and their original home had been the dunghill. o in the morning they all got up; and after some more conversation, they told him that he should not depart till they had shown him the rarities of that place. And first they took him into the study, where they showed him records of the greatest antiquity; in which, as I remember my dream, they showed him the first pedigree of the Lord of the hill, that he was the Son of the Ancient of Days, and came by an eternal generation. Here also were more fully recorded the acts that he had done; and the names of many hundreds that he had taken into his service; and how he had placed them in such habitations that could neither by length of days, nor decays of nature, be dissolved. Then they read to him some of the worthy acts that some of his servants had done. As how they had "subdued kingdoms, worked righteousness, obtained promises, stopped the mouths of lions, quenched the violence of fire, escaped the edge of the sword; out of weakness were made strong, became valiant in fight, and turned to flight the armies of the aliens". Then they read again in another part of the records of the house, where it was shown how willing their Lord was to receive into his favour any, even any, though they in time past had offered great affronts to his person and proceedings. Here also were several other histories of many other famous things, all of which CHRISTIAN had a view. Things both ancient and modern; together with prophecies and predictions of things that have their certain accomplishment, both to the dread and amazement of enemies, and the comfort and solace of pilgrims. The next day they took him into the armoury; where they showed him all manner of furniture, which their Lord had provided for pilgrims: sword, shield, helmet, breastplate, all-prayer, and shoes that would not wear out. And here there was enough of this to harness out as many men for the service of their Lord as there be stars in the heaven for multitude. They also showed him some of the instruments with which some of his servants had done wonderful things. They showed him Moses' rod; the hammer and nail with which Jael slew Sisera; the pitchers, trumpets, and lamps too, with which Gideon put to flight the armies of Midian. Then they showed him the ox's goad wherewith Shamgar slew six hundred men. They showed him also the jawbone with which Samson did such mighty feats; they showed him, moreover, the sling and stone with which David slew Goliath of Gath; and the sword, also, with which their Lord will kill the man of sin, in the day that he shall rise up to the prey. They showed him many excellent things besides, with which CHRISTIAN was much delighted. This done, they went to their rest again. he saw a most pleasant mountainous country, beautiful with woods, vineyards, fruits of all sorts, flowers also; with springs and fountains, very delectable to behold. Then he asked the name of the country. They said it was Immanuel's Land; and it is as common, they said, to and for all the pilgrims as this hill is. And when you get there, from there, they said, you may see to the gate of the Celestial City, as the shepherds that live there will show you.